We were Christmas shopping this week, and stopped in at Zandbroz, a funky out-of-the-ordinary shoppe here in Fargo (and in Sioux Falls). I believe Zandbroz is the last independent bookstore in Fargo, so between the good books, cool toys, and handmade jewelry, we know we can find good stuff there. 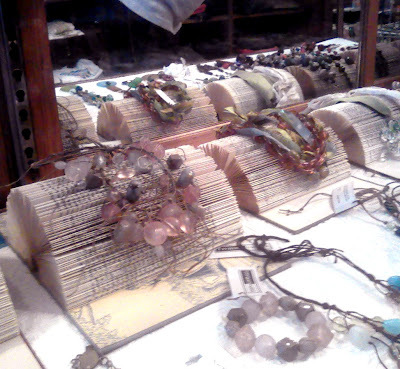 In a jewelry display case, we observed the display on the right -- showing off necklaces are books! 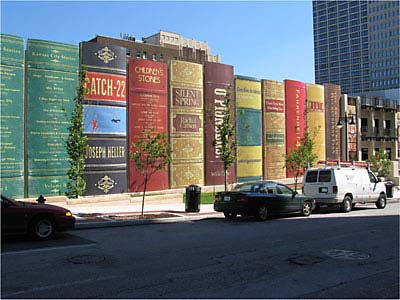 It looks like it took quite a bit of work to do all the books; I believe there were five or six. Each page was folded back on itself, so the outer edge touched the inner spine. Then, when the book was laid flat, the pages fan out as seen there, with some nice detail of the text on the page showing on the folded edge. All of the books were old, leatherbound books, which makes me cringe a little to see such fine books bent and creased like this, but visually it's a great use of found objects and art in one. The New York Times, happily releasing their decades of archive articles to the world, has some fun stuff -- such as this collection of advertisments that ran in their book review supplements. 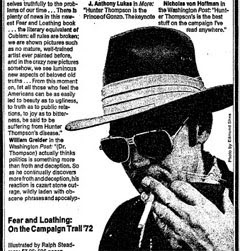 Hunter Thompson, of course, is a favorite, but there's enough of everyone's favorites to enjoy. I think the funnest part is looking at these books through the eyes of someone who didn't know these would be classics, or even that these authors would ever amount to anything. 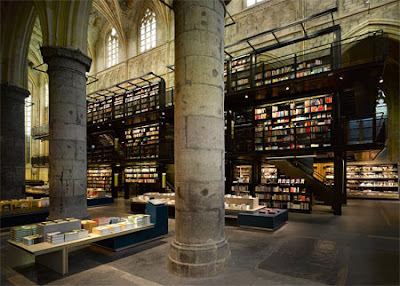 Once devoted to conserving the knowledge found within one particular book, it now houses thousands -- as the home of a bookstore. I can't think of a better use for a church. 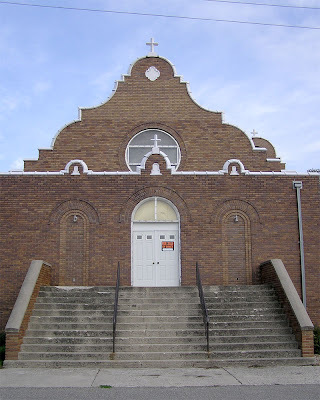 In fact, it was one of the first things I thought of, when we drove through Page, ND and found that James Catholic Church is for sale. While we're plum out of church-buyin'-monies, we did call to find out how much they were asking -- too bad, they were rude about it, and still didn't tell Wifey how much it would cost (my guess is they're hoping another church will buy it and want to discourage everyone else). It's odd to see a southwestern, Mission-Revival style church plopped down in the North Dakota prairies; perfect for housing a non-traditional church occupant. The Interstitial Library is a haughty concept, but one rooted in semantics: As the strict cataloging system used by libraries is essentially infinite, there are a lot of books that have slipped through the cracks, either by not entering a standard library, or by simply not having been created yet. On the surface it's a rather silly concept , but on the other hand, it gropes at understanding the scale of actual literature hinted at by monkeys with typewriters: Infinite monkeys have a chance at hitting a Shakespeare, but, as probability goes when you reach infinity, could just as easily produce today's gradeschool lunch menu, A Million Little Pieces, or -- gah! -- this particular blog post. That's a lot of both existing and potential literature, and without the help of some library to catalog and track such infinite readings, you're stuck with the finite and self-contained library down the street. Granted, you're more likely to find what you're looking for at the public library, but the thing you're not looking for is much more interesting.